A very saavy and sophisticated pal of mine gave us a very stylish housewarming gift recently. 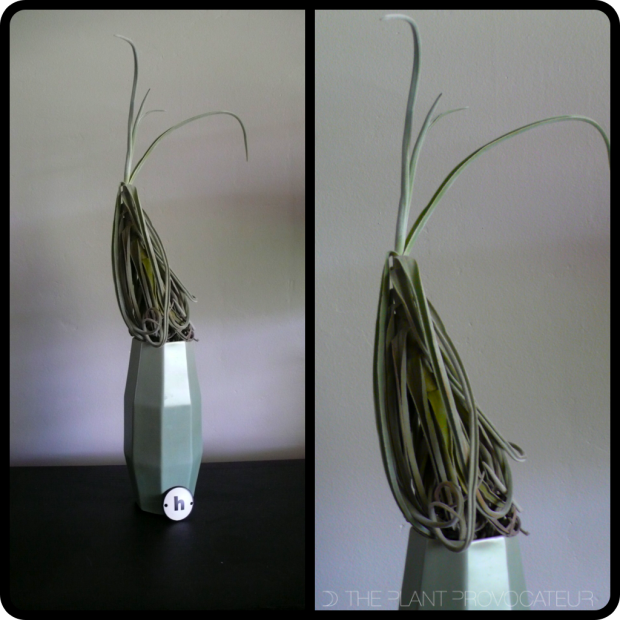 Check it out...its a tillandsia with a mind all of its own called Tillandsia duratii. Now Tillandsias are everywhere these days. Thanks to people like Flora Grubb in San Francisco and Martha Stewart they're the groovy go-to for growing on. You can't open a Crate and Barrel or West Elm catalogue without seeing them shoved in every nook and cranny of a photo spread. They are what I call Future Flora. They're in vogue. Super easy to care for, low maintenance, the perfect plant for anyone with a black thumb, and they're fashionable. The fact that you can throw them naked as the day they were born up on a bookshelf (they don't require soil to grow), leave them to do their thing , spritz most of them or dunk 'em in a sink of water once or twice a week (some you shouldn't water much at all), and never really worry about them makes them the anybody-and-everybody-can-have-them plant. Now the thing that makes Tillandsia duratii so cool is that it uses its leaves to push its growth higher and higher and higher. Like a spider monkey trying to get to the top of the trees. Now this superstar pal of mine also gave us a really cool vessel to launch our spider monkey skyward. The look is ultra cool in our house. The added bonus is that when our new tilly blooms, it will send out flower spikes of tiny smell-a-licious purple flowers. The smell is a delicate perfume that can fill an entire room. So if you're into the idea of having something super chic and plant unique styling your profile find yourself some future flora.